For many LGBT older adults, the holidays are a time of social isolation and vulnerability. LGBT older adults are less likely to be married or partnered, and are twice as likely to live alone, leaving them particularly vulnerable to social isolation. MAP, along with partners at SAGE and the Diverse Elders Coalition, have released a new infographic providing resources for LGBT elders as well as information about the challenges facing LGBT older adults. 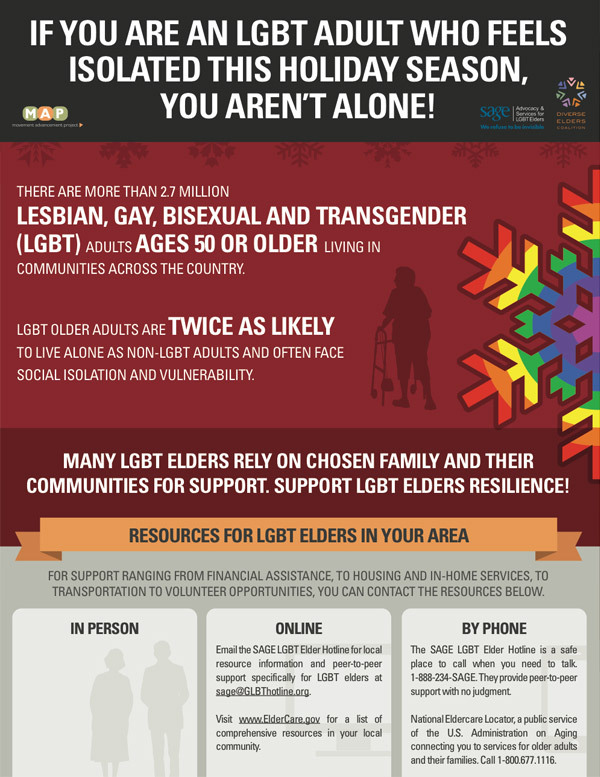 The infographic is designed to help isolated or lonely LGBT older adults know that they are not alone and that there are resources available ranging from financial support to identifying inclusive and affirming housing to hotlines with judgement-free support. The infographic is translated into six different languages: English, Spanish, Tagalog, Vietnamese, Arabic and Chinese. Movement Advancement Project, SAGE, and Diverse Elders Coalition. November 2017. Infographic: LGBT Seniors and Social Isolation. http://www.lgbtmap.org/LGBT-Older-Adults-Social-Isolation (date of access).